The following conceptual drawings represent early thinking. Much has changed as we study the river and consult with user groups. The documents have been posted in an effort to show how thinking has evolved. These are not plans, but ideas and may or may not show up in final blue prints. Green Grand Rapids updates the citywide 2002 Master Plan with a focus on the importance of green infrastructure, sustainability and quality of life in maintaining the city’s livability and competitive edge in attracting and retaining residents and businesses. Grand Rapids Whitewater was born of the Green Grand Rapids process. 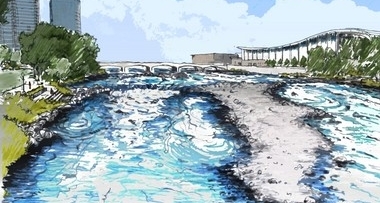 Conceptual plan of how the community might enhance the Grand River channel bed and banks to restore the ecological, cultural and recreational functions of the historic rapids. City of Grand Rapids resolution to acknowledge past accomplishments and support future work of GRWW. This study focuses on the potential for expanded economic activity related to the restoration of the Grand River in Grand Rapids. 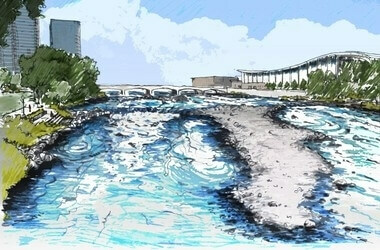 These documents show early ideas for the river restoration project. None of these documents are final. 1.5-mile stretch of the Grand River immediately north of the 4th street dam. Including river bottom sediment investigation. Michigan Department of Natural Resources Fisheries Division Special Report. Including geology, hydrology and animals of the Grand River watershed. A draft version by the Michigan Department of Natural Resources. Annual report to the Great Lakes Fishery Commission. A study of the Grand River geology. Dams constructed in the late 1800s were built on bedrock exposures which served as natural hydraulic controls. Prior to dam construction, an abrupt change in river gradient at these exposures resulted in the rapids for which Grand Rapids is named.